WANdisco Fusion is an enterprise-class software platform that solves the problem of keeping data consistent in a distributed environment - on premises, hybrid-cloud, multi-region, and multi-cloud. WANdisco Fusion is powered by a high-performance coordination engine that uses consensus to keep unstructured data accessible, accurate, and consistent in different locations. WANdisco Fusion enables a LiveData Platform, which ensures that your data stays accurate and consistent across all your business application environments, regardless of geographic location, data platform architecture, or cloud storage provider. A LiveData capability is an evolved approach–and new standard–for simplifying data migration to the cloud and de-risking data operations in a heterogeneous architecture. Our game-changing, patented Distributed Coordination Engine (DconE) technology, used in WANdisco Fusion and our other products, keeps data consistent across different data centers no matter where they are in the world. It gives organizations the ability to integrate different types of LiveData into the same environment. It means you have no unused capacity as all your hardware is used all the time as you read and write to any data center. LiveData for MultiCloud is an enterprise software platform built to enable guaranteed data consistency across multi-cloud and multi-region datacenters. The solution enables applications to access and modify data in mixed environment object stores (e.g., Azure Blob Storage, Amazon S3) ensuring data is available and consistent across all of them. Fully operationalize Hadoop to exceed the most demanding SLAs across clusters running any mix of distributions any distance apart. Prevents administrator error leading to extended downtime and data loss during disaster recovery. The only solution that provides continuous consistent connectivity to data as it changes in NFS, NAS and SAN storage systems and replicates it to any other WANdisco Fusion supported storage environment, on-premises or in the cloud. No migration downtime as source and target environments operate in parallel during migration. No overhead imposed by periodic directory scanning and batch data transfer. No one-way multi-master synchronization with our continuous one-way to N-way synchronization. No lack of data consistency across source and target environments. No need to limit the number of servers and data centers with our unlimited scalability. Continuous replication of selected data at scale for Oracle Big Data Appliance. Clusters already in production scale-up with existing hardware for greater cost savings and ROI. Deploy Oracle BDA in environments running any mix of HCFS compatible distributions with a path for full cluster migration with no downtime and no data loss using WANdisco Fusion. A leading US business and consumer banking firm deployed our ground-breaking, patented technology with Oracle’s Big Data Appliance across multiple data centers. Extend to the cloud for on-demand burst-out processing, offsite DR and data archiving with our game changing, patented technology at the core of WANdisco Fusion for both Amazon S3 and EMR. Use capacity as required for burst-out processing with Amazon Athena. Integrate on-premises Hadoop clusters with AWS Data Lake with WANdisco Fusion and Amazon S3. Move data between any Fusion supported on-premises environment and Amazon S3 or EMR. Simple setup in both on-premises and Amazon environments using AWS Marketplace Cloud Formation templates. Intuitive admin console for monitoring, scheduling and audit. Analyze and view data that has been replicated with Amazon Athena providing capacity as required for burst-out processing. Stand up an EMR cluster referencing data that is actively being replicated into S3 which could serve as a low-cost Disaster Recovery environment in the event of a failure. Move data between Amazon and any other Fusion supported cloud environment including Microsoft Azure, IBM OpenStack Swift and Google Cloud. Bulk transfer static and changing information from big data applications to Amazon S3 with the game changing, patented technology at the core of WANdisco Fusion for AWS Snowball. Write to your local cluster while in transit, replicating with guaranteed consistency. Write to AWS Snowball using the same API that they use to interact with the Amazon S3. Operate cloud and on-premises applications using the API as you would normally. Continuously replicate and recover from intermittent network or system failures automatically. Take advantage of storage on AWS Snowball without experiencing the delays over the network. AWS customers can now use the bulk transfer capabilities of AWS Snowball to transfer both static and changing information from Big Data applications to Amazon Simple Storage Service ("Amazon S3"), with guaranteed data consistency. Extend to the cloud for on-demand burst-out processing, offsite DR and data archiving. Add WANdisco Fusion to an Azure HDInsight cluster via a single-click installation from within the Azure marketplace to provide continuous replication of selected data at scale between multiple Big Data and Cloud environments. WANdisco Fusion, unlike other solutions, does not require dedicated hardware or storage systems leading to greater cost savings and ROI. Data is replicated as soon as change occurs, regardless of where those changes are initiated with guaranteed consistency. Users can replicate data to other Fusion supported on-premises and cloud environments, allowing data to span DFS, object storage and other systems. An administrator can select subsets of content for replication, with fine-grained control over where data resides. Replication is continuous and automatic, recovering from intermittent network or system failures automatically so that the need for administration is eliminated. Bulk transfer static and changing information from big data applications to Azure Cloud with the game changing, patented technology at the core of WANdisco Fusion for Microsoft Azure Data Box. Write to your local cluster while in transit, replicating with guaranteed consistency. Write to Azure Data Box using the same API that they use to interact with the Azure Cloud. Operate applications using the API as they would normally. Take advantage of storage on Azure Data Box without the delays over the network. Select subsets of content for selective replication with fine-grained control. Continuous replication of selected data at scale for Oracle Big Data Cloud Service. 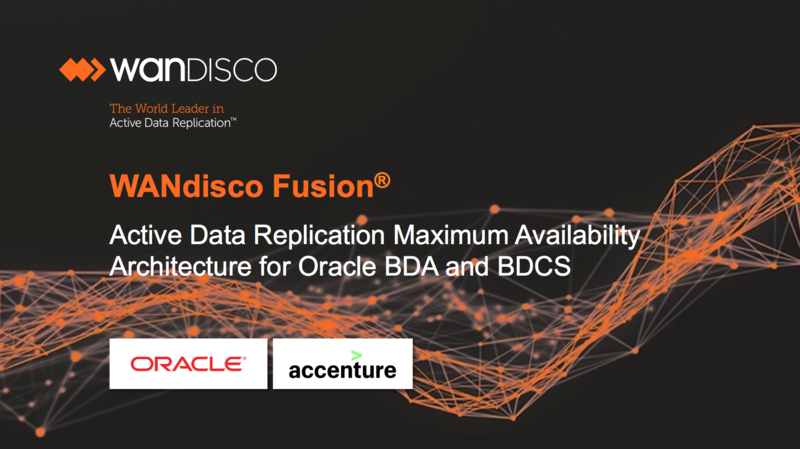 Deploy Oracle BDA and BDCS in environments running any mix of HCFS compatible distributions with a path for full cluster migration with no downtime and no data loss using WANdisco Fusion.